Our second stay and it was fantastic. We liked the most the buffet by Hartisan restaurant, the service is great and food is super delicious. The room cleaning was also very high standard. The check in process was fast and flexible. The overall service is very very good. I would like to highly value and appreciate the help of the concierge in charge at 8:30pm on Thursday 10 January. They really helped me finding my traveling documents that were forgotten in a hand bag in a regular taxi after I reached the Airport. I don’t have enough words to thank that gentleman who handled the situation and found the taxi driver and arranged for his return to the Airport with my bag. Nothing is equivalent to his profession attitude and dedication. I wish him and all his loved ones all the best of health and a safe and wonderful happy life. The two bed apartment is big and very comfortable. Lock in a great price for Hilton Dubai The Walk – rated 8.2 by recent guests! 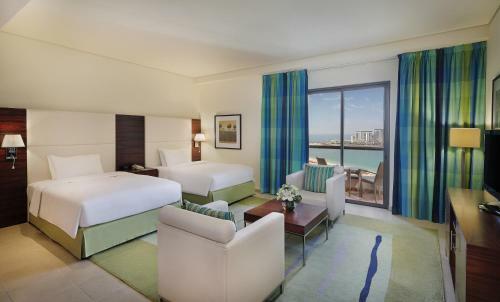 Hilton Dubai The Walk This rating is a reflection of how the property compares to the industry standard when it comes to price, facilities and services available. It's based on a self-evaluation by the property. Use this rating to help choose your stay! One of our top picks in Dubai.This property is 1 minute walk from the private beach. Located on The Walk near Dubai Marina, just steps away from numerous beachfront cafés and the new 'The Beach' Mall, which offers a variety of entertainment, dining and shopping options. 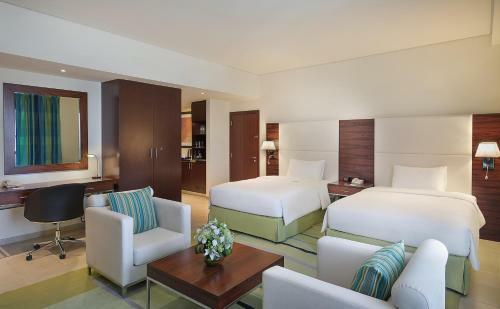 Hilton Dubai The Walk features an outdoor swimming pool, a gym and a vast array of dining options. 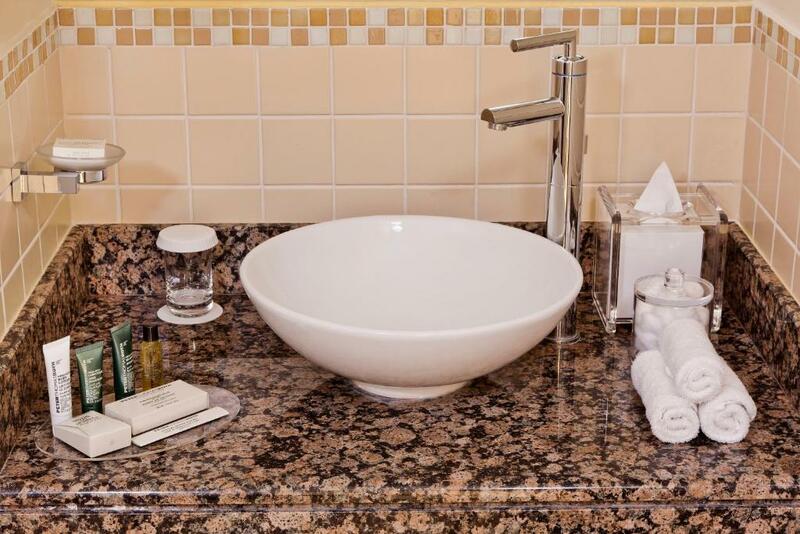 Offering a modern and tasteful décor, this hotel's luxurious accommodations are well equipped. Each features a stunning view of the Jumeirah beachfront, the Palm Jumeirah and the bright blue waters of the Arabian Gulf. Guests can enjoy the cozy Grape Escape wine bar and the modern Pure Sky Lounge and Dining on the 35th floor. Free WiFi is also available in public areas. The Dubai International Airport is located a short 30-minute drive away. The hotel provides a shuttle service upon request. Hilton Dubai The Walk is connected via a bridge to the Hilton Dubai Jumeirah Resort, allowing easy access to all resort's facilities. When would you like to stay at Hilton Dubai The Walk? This open-plan apartment is located on a higher floor and features a living room, flat-screen TV with movies on-demand and DVD player, and a dining area. Other features include a kitchen equipped with an oven, dishwasher, fridge, silverware and laundry room. Featuring partial sea view, this air-conditioned apartment has a bedroom with 2 single beds and a bedroom with a large double bed. It has a living room with a flat-screen satellite TV and a kitchen with a microwave including a balcony that is subject to availability. Featuring a view of the Arabian Gulf, this air-conditioned apartment has a bedroom with 2 single beds, while the other 2 have a large double bed. There is a living room with a flat-screen satellite TV, a kitchen with a microwave and a balcony that is subject to availability. This air-conditioned apartment has a bedroom with 2 single beds and a bedroom with a large double bed. It has a living room with a flat-screen satellite TV, a terrace on availability and a kitchen with a microwave. This air-conditioned apartment has 4 bedrooms, a kitchen with a microwave, a separate living room with a flat-screen TV and a balcony that is subject to availability. This air-conditioned studio has flat-screen satellite TV and includes a kitchen with a microwave and a dishwasher. Select studios feature balconies on availability. This air-conditioned studio has a flat-screen satellite TV and includes a kitchen with a microwave. Select studios feature balconies on availability. Featuring panoramic Arabian Gulf view from the balcony, this studio offers a flat-screen satellite TV with movies on-demand. Most of the studios have a balcony. This air-conditioned studio features a flat-screen satellite TV with movies on-demand. Most of the studios have a balcony. Featuring a balcony (subject to availability) with partial sea views , this air-conditioned apartment has a kitchen with a microwave and a separate living room with a flat-screen TV. There are 2 bedrooms with a double bed and another bedroom with an extra large double bed. The 4th bedroom has 2 single beds. On the 42nd floor, this duplex apartment offers loft courtyard view. This apartment has an open-plan living and dining area on the entrance floor with a modern and full kitchen. The staircase leads up to a fabulous mezzanine floor with an open bedroom and private bathroom with balcony on availability. Located on the 42nd floor, this duplex apartment offers view of Arabian Gulf or Dubai Marina. This apartment has an open-plan living and dining area on the entrance floor with a modern and fully equipped kitchen. The staircase leads up to a fabulous mezzanine floor with an open bedroom and private bathroom. This suite has a tea/coffee maker, tumble dryer and bathrobe. This studio has a seating area, sofa and mini-bar. This studio features a kitchenware, seating area and stovetop. House Rules Hilton Dubai The Walk takes special requests – add in the next step! Hilton Dubai The Walk accepts these cards and reserves the right to temporarily hold an amount prior to arrival. For all prepaid bookings, original credit card used should be presented on check in, where charge has been made. Please note that smoking rooms are subject to availability at the time of arrival. -The number of extra beds in a room is 1 or maximum 2 depending on the room category. -Supplements are not calculated automatically in the total costs and will have to be paid for separately during your stay. The Hilton the Walk is located right in the middle of JBR. The location is perfect whether you want to walk around or get on public transport to go and visit the city. The beach and the pool are great. Very family friendly. Food is perfect. We stayed with the half-board option and were not disappointed. The buffet restaurant offers different themes every night and you can dine in any other restaurant if you wish to. Staff is really attentive and keen to offer the best service possible. You can see they care about your experience. Breakfast offers a wide range of options.